The Detective is a Minifigures Minifigure released in 2011 as one of sixteen minifigures from 8805 Minifigures Series 5. The detective has a dark tan printed torso with yellow hands. His torso represents a jacket with a large collar and five buttons on it. The jacket has light tan stripes running across it along with a few light maroon stripes, as well as maroon stripes running from top to bottom. He has dark tan legs, and a deerstalker cap with light tan and maroon stripes on the sides. The detective comes with a dark grey magnifying glass. Several well known minifigures are mentioned in the Detective's bio, such as The Brickster from LEGO Island, Sam Sinister from Adventurers, and Timmy from Time Cruisers. The racing drome and the robotic monkey are referencing the LEGO Drome Racers subtheme of Racers. He appears on a billboard in LEGO City Undercover. This is a description taken from LEGO.com. Please do not modify it. 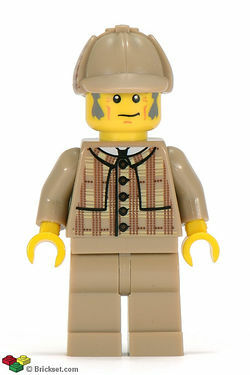 (visit this item's product page) If you’ve got a major mystery to solve, the Detective is your minifigure. He’s famed across the land for his amazing deductive skills, and he never gives up on a case, no matter how impossible it may at first appear. He just whips out his magnifying glass, follows the clues, and always arrives at the right solution in the end. If you’ve got a major mystery to solve, the Detective is your minifigure. He’s famed across the land for his amazing deductive skills, and he never gives up on a case, no matter how impossible it may at first appear. He just whips out his magnifying glass, follows the clues, and always arrives at the right solution in the end. You may have heard of some of the Detective’s most famous cases. He’s the one who single-handedly solved the Brickster’s Baffling Brick-Napping, the Sam Sinister Switcheroo, and the Mystery of Timmy’s Nose. Why, he even tracked down a missing pet from the Racing Drome…and robot monkeys don’t leave footprints!